UNISON has commenced an appeal against Rushcliffe Borough Council, which has refused the union permission to use empty fields as a safe assembly area for a public march on 24 February against Nottinghamshire County Council budget cuts. The union has approval from the Police for the event, but is required to have a safe “point of assembly”. Despite the land being vacant, and only used for overspill car parking for Trent Bridge cricket matches, the council claims that to allow permission might be seen as “supporting a political initiative”. The union believes the refusal to allow permission will be seen by local voters as politically motivated in itself. The union has vowed that the planned march through West Bridgford will go ahead on 24 February 2011. The union will liaise with the police to identify an alternative point of assembly if the council will not budge. The union expects around 1,000 people to take part in the march, which will run from 11am to 12noon and end at County Hall. Notts Cuts Watch #11, from Notts Indymedia, covers cuts and anti-cuts news in the period from Monday 20th until Sunday 26th December 2010. Even as Christmas approached, the cutting of public services in Nottinghamshire continued. The festivities have taken the sails out of the resistance to these attacks, but I’m sure it will be back with a vengeance in the new year. (On which note, make sure you put the Combating the Cuts event on January 15th in your diary.) Until then, why not spend some of the post-Christmas lull reading up on exactly what’s being cut? Knowledge is power and all that. A member of Notts SOS has written the latest article in The Guardian’s The cuts get personal section. Our group has a genuine belief that the cuts could be stopped if sufficient protest was amassed locally and nationally. I would like to believe this, and am certainly prepared to act as though I believe it and move towards that end. But sometimes you just have to fight for things even if you don’t think you’ll get them. My own pragmatic and more realistic hope is that during what is to come in the next few years, sufficient noise will be made by groups like ours for people to realise what is going on: that this is a bad and unfair way to run things – and that we are not all in this together. Capitalism – as it has evolved by the 21st century – has caused this. There could be better ways of controlling and regulating it if only there was a party with the will and the ability to do it, and a people sufficiently engaged and aware to vote them into power. Want to get involved? Come to the Notts SOS conference on 15th January 2001. Our first meeting of the New Year is on Monday 10 January 2011 at 7.30pm in the ICC/YMCA. See https://nottssos.org.uk/contact/ for venue information and how to contact us. Even with Christmas only just over the horizon, the cuts have continued over the last week, with the announcement of the funding settlement for local councils hitting Nottingham particularly hard. Even Cuts Watch has been cutback, this week’s edition arriving late and in a slimmed down version. “Normal” service may or may not resume after the holiday period. The start of the Notts SOS meeting on Monday 13th December 2010 formed part of an ITV news report on the more than £60 million Nottingham City Council cuts announced on the same day. Councillor Graham Chapman also attended the meeting where he was vigourously challenged that the City Council should not implement cuts. Two events discussed at the meeting will take place this week: Save Gedling School on Wednesday at 10am will Lobby County Hall. Then on Saturday the third Nottingham tax avoidance demo will start at Vodafone Clumber St. store on Saturday at 1pm. Next week there will be a protest in the Market Square outside the Executive Board meeting on 12.30pm on Tuesday 21 December in Opposition to Nottingham City Council introduction of Day Centre charges and increases. Special notice is given of the Notts SOS conference that will take place on 15th January. Details to follow. This is a weekly bulletin detailing how the Age of Austerity has been impacting Nottinghamshire over the last week or so. This edition includes information on grit bins in the city, consultants in the county and what the students did this week. The bulletin also includes a helpful run-down of anti-cuts events in Nottingham over the next week as below. Note that we’re meeting on Monday 13th December at 7.30pm. This will be our last meeting before Christmas, so try and come along if you can. government “review and change” their policies to avoid “leading to a wasted generation in Nottingham and the UK”. * Monday 13th December, 7.30pm, Notts SOS meeting. Open planning meeting at the International Community Centre, Mansfield Road. See https://nottssos.org.uk/contact/ for venue details. * Monday 13th December, 7.30pm, the local labour party is holding a debate at the Labour Group’s City Agent’s office about the Nottingham Labour Party’s strategy for the local elections next in May next year. Council leader Jon Collins is chairing. Why not go along and make some helpful suggestions? The address is Unit 13a, John Folman Business Centre, Hungerhill Road, NG3 4NB. * Wednesday 15th December, 11am, Nottinghamshire County Council cabinet meets to discuss the budget and closure of Gedling School. Save Gedling School campaign are planning a protest at County Hall at 10am. Supporters are invited to bring placards and banners. Balloons will be release. Check Facebook for details. * Saturday 18th December, the latest day of action against tax avoiding corporations. Nottingham details are on UK Uncut and on Facebook. As will other events, meet 1pm at Clumber St. Vodafone. Special carol song sheets will be available. Notts Cuts Watch #8 (29th Nov-5th Dec 2010) – this is the latest installment of the excellent Notts Cuts Watch which is a round up of the previous week’s cuts and anti-cuts news courtesy of Nottingham Indymedia. See http://nottingham.indymedia.org.uk/articles/775. It also includes a list of forthcoming events for this week. These events are also listed below, plus details of some of these events and more dates specific to education activity are mentioned on the Nottingham Students Against Fees and Cuts website. The news this week has been dominated by snow which has rendered the north of the Nottinghamshire and much of the country almost inaccessible. But a little frozen water isn’t going to stop the important business of cutting private services and there’s no shortage of material for this week’s Notts Cuts Watch. All of it brought to you in a new, shorter format which is hopefully easier to use and more interesting . The following is a run-down of the anti-cuts events happening over the next week (thanks to Notts Cuts Watch compiler). Monday 6th December, 2.30pm. Rally outside the Great Hall in conjunction the Vice Chancellor meeting that the occupation successfully negotiated. Monday 6th December, 3.30pm all students are invited to join an open forum discussion with the Vice Chancellor over the raise in tuition fees and cuts to the university, which is taking place in the Great Hall. All students are allowed to come, even if you weren’t in the occupation; even if you’re unsure about your position. 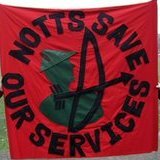 Tuesday 7th December, 7.30pm,The 3rd meeting of the Nottingham ‘Anarchists Against the Cuts‘ non-group will take place at the Sparrows Nest. Wednesday 8th December, protest against Nick Clegg in Sheffield. University of Nottingham Students’ Union are putting on coaches, leaving the university at 10am. It isn’t clear if this is open to non-students. Wednesday 8th December, Defend ESOL: a meeting about a cut to funding for ESOL (English for speakers of other language), called by UCU (Universities and Colleges Union) and NNRF (Nottingham and Notts Refugee Forum). This cut to ESOL will affect both service users and teachers. Thursday 9th December, MP’s will vote in the commons to raise tuition fees. NSACF have organised coaches to take students, staff and supporters down to London for the National Day of Action. The suggested donation for the coach is £5, but whatever you can afford. If you are interested, email: nsafac [at] gmail.com with your name. Coach leaves 9am from Portland Building steps, University of Nottingham. Here is the latest round-up of mainstream press reporting on cuts and anti-cuts action from Notts Indymedia. Events this week include Gedling school protest march on Thursday and student fees actions on Wednesday. Venue: The Sumac Centre, 245 Gladstone Street, Forest Fields, Nottingham, NG7 6HX. 7.30pm. This is one of an ongoing new series of open discussions at the Sumac Centre with an anti-capitalist theme. Come to listen or talk or both. On Saturday 20th November 2010 the lively demonstration and march called by Notts Save Our Services assembled on the Forest Recreation Ground. Well over one thousand residents, workers, service users, pension and welfare recipients, parents, teachers, university and school students from all over Nottingham and Notts brought themselves along on a misty morning, and carried placards and banners against cuts. We marched to Nottingham city centre down Mansfield Road and many more people clapped from the pavement or hooted horns as we passed. At Speakers’ Corner a rally was held with many speakers explaining the effect of the cuts and encouraging more people to get involved with Notts SOS. Queens Street had to be closed to accommodate everyone. Watch a video of the march as it left the Forest (links to photos are further below) and an edited video of some of the speeches on the podium and singing before and on the march. Read press release advertising the march and rally: http://nottingham.indymedia.org.uk/articles/679. BBC Nottingham news article: http://www.bbc.co.uk/news/uk-england-nottinghamshire-11803578 (only 500 though! Journalist must have counted or estimated numbers at the beginning when the march was assembling whereas we did a proper roadside count on Mansfield Road). Anyway ITV News said it was 3000! See also Evening Post website coverage. More reports and media to follow. Well done to all that marched. We hope this will inspire more people to get involved with Notts SOS. In January we will hold a conference in Nottingham to work out a wider strategy as we know there are many and diverse ways the government cuts will affect our lives. In the meantime we hope that more anti-cuts groups will form whether around a specific campaign like Save Gedling School or with a general ‘save our services’ aim. Notts SOS planning meetings are held on Mondays in the International Community Centre. Details of these meetings and other planned events can be found on our website.